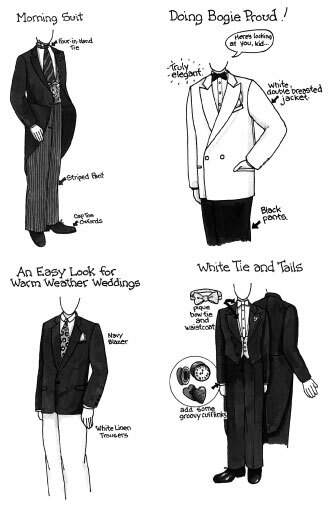 Proper fit is the key when it comes to dressing the men in the wedding party. To determine the fit, try on the suit or tuxedo, including the correct shirt and shoes. Place your arms at your sides, fingers extended. The hem of the jacket should be no longer than your middle finger. The sleeve should grace the top of your hand, and your shirt cuff should peek out from the jacket sleeve no more than half an inch. Your trousers should skim the heel of your shoe in back and break slightly over the tops of your shoes in front. Because the extra buttons on a double-breasted jacket draw the eye toward your midsection, that style looks best on someone who's tall and slender. To create a more debonair silhouette, consider having some extra padding put in the shoulders and the waist taken in a bit. Whether you go for a traditional or trendy look, you need to understand the elements of style at your disposal, as shown in Figure 1, and how to carry them off. Cutaway or morning coat: In its traditional design, this coat is for the most formal morning weddings. Coats are black or gray with a single button at the waist and one broad tail at back. You wear this style of coat with a winged-collared dress shirt, ascot, and striped trousers. If you're going all-out and — this is important — you can carry it off without looking like you're playing dress-up, add gloves, spats, and a top hat, and perhaps even a walking stick. It can be made a bit less formal with a patterned tie in lieu of the ascot. Dinner jacket: In classic white or ivory or a subtle pattern of the same, with peaked lapels or shawl collar. Works well in summer months or in warm climates, in the afternoon or evening, and is considered an appropriate substitute for a standard tuxedo. Great for a casual wedding or a rehearsal dinner. Looks particularly well with formal black trousers with a side satin stripe — think Humphrey Bogart in Casablanca.Available for purchase or rent at a formalwear shop. (With some vigilance, you may unearth one in a vintage clothing boutique, but go over it carefully for stains, rips, missing buttons, and so on.) You may wear a white dinner jacket even if your ushers are in black tuxedo jackets. Some designers are showing white-on-white suits replete with vests. Stroller coat: Variation of the morning coat, usually hip length. Looks good with fancy waistcoats. Designers such as Kenzo and Christian Dior Paris have in recent years shown versions with a touch of whimsy. Tails: A jacket that's short in front with two longer tails hanging in back. Worn with braces (suspenders) and a white pique shirt, vest, and bow tie (as in "white tie and tails"). Very formal. Traditional tuxedo or black tie: Usually worn after 6 p.m., but can appear at a formal daytime wedding anytime after noon. A black or gray jacket with a single button is the most classic. Has shawl, peak, or notched lapels. Worn with matching flat-front (or one-pleat) trousers, bow tie (no clip-ons or glitzy colors), and suspenders, vest, or cummerbund. For some of the elegance of tails without the full grandeur, you can wear a tux with a white vest and white tie. Updated black tie: The evening suit is a newer variation on the classic tux with the satin or grosgrain trim on the lapel and pants legs, albeit subtly. These tuxes are worn with a black shirt and a regular tie in lieu of a bow tie, and often with a belt rather than suspenders. The gorgeous dark suit: For a dressy but not formal wedding or for the groom who absolutely won't wear a tuxedo. Choose charcoal, black, or navy and a solid-color or subtly patterned tie to dress it up. Notch lapel: This jacket lapel boasts V-shaped cuts pointing inward where the collar and lapel meet the jacket (as in Figure 2). Accentuates the horizontal, so not a good choice if you're on the heavy side. Peaked lapel: A jacket lapel that includes two points of fabric on either side that project upward, with narrow spacing between the lapel and collar. Shawl collar: A rounded jacket lapel (as in Figure 2) that rolls back in a continuous tapering line. Double-shawl collars roll to reveal satin lining. Looks very elegant trimmed with satin stripe or contrasting piping. A great choice whether you're tall and husky, short and stocky, or generally super buff and want to create a more vertical line. Buying a tuxedo or a good suit is always a better investment than renting a cheap tuxedo. Rented tuxedos unfortunately often look like rented tuxedos, as ill fitting and uncomfortable as bad toupees. They're also not cheap, running between 25 and 50 percent of the purchase price of an average tuxedo. 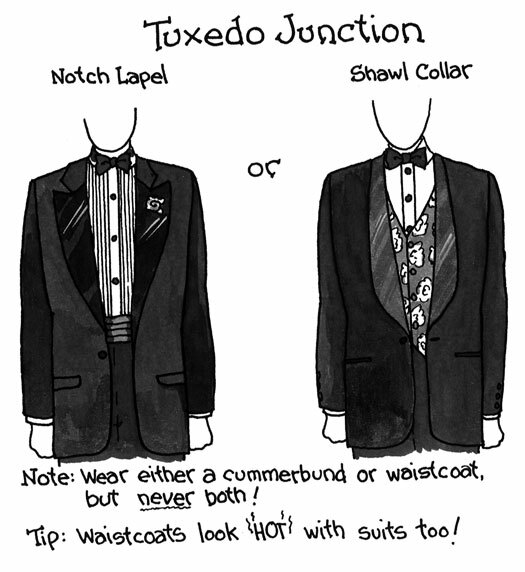 It is a safe bet that you'll get more wear out of a tuxedo that you own than you may think. Remember, also, that you'll be looking at these photos for the rest of your life. If you're renting, don't spend the extra dough for the shoe option. Rental shoes by definition fit poorly and look worse. Shining up a pair of your own makes infinitely more sense. You're getting married, not going bowling. Finding the right suit, tuxedo, and accessories can take as much time as locating the perfect wedding gown. If you're getting married in a popular wedding month and are planning to rent for yourself and/or the ushers, reserve the tuxedos as soon as possible so that you don't wind up with the dregs. Because you'll be on your honeymoon, have the best man return rented outfits the first working day after the wedding. If you do rent, you can usually pick up the tux two or three days in advance. Check to make sure that all the buttons are on and secure and that the tux has no stains, cigarette burns, or other damage.